Happy Friday~ So, do you have a lot planned for the 4th? We are staying pretty close to home awaiting the birth of our newest Grand baby which is due next week. We are also planning on going to the local parade, festivities and fireworks. How about you? They are super easy to make and everyone loves them! Yum! I kept the tags rather simple as they are going to just throw it away anyway~ I started with making a tag using the Art Philosophy cartridge. 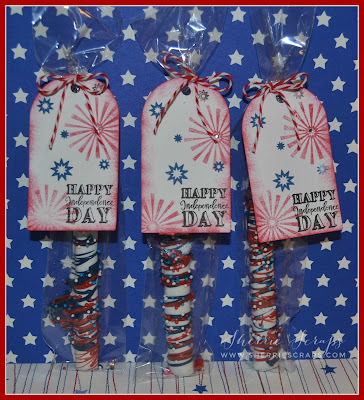 I cut it at 3 1/2 and stamped the fireworks background with Pretty Cute Stamps~Fireworks stamp set in red and blue. I then stamped the sentiment which is also from this stamp set in black for a little dimension. I finished with a little gem in the center of one of the fireworks and tied them on with Berry Trendy Twine and tied a bow~Viola..done! Have a WONDERFUL and SAFE weekend!!!! They are super fun & yummy!! Totally cute tag!! A perfect treat for the kids!! They will love it my friend!! These are so fabulous, Sherrie!! The pretzels look so yummy!! I'd love one right now!! The tags are the perfect decorations!! 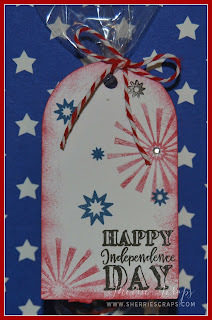 I love the fireworks stamps!! They look amazing!! Your daughter's co-workers will love these - they won't last long!! Wow! These are amazing! 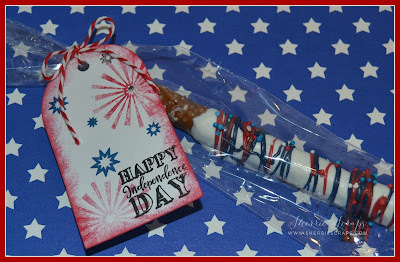 The pretzels look super yummy and the tags are so perfect for your 4th celebrations! (I hope they don't get thrown away ;) thanks for joining us at Pretty Cute Stamps for the AG challenge! Hope to see you back again! These treats look so yummy-licous! I love those pretzels! Sweet tag you created too, those stamped fireworks look awesome! Have a fabulous holiday weekend! Have a blessed day and a safe 4th. More yummy treats! I think I am getting fat just looking at your posts! : ) Happy 4th of July to you and your family! Congratulations to you Sherrie, I didn't know that you were going to be a Grandma again. How Exciting! I am Loving your Tags. Hope you and your family have a wonderful Fourth of July. What a cue treat for the little ones. The tag is adorable. Hope you and your family have a safe and fun filled day. Happy 4th. These are sooooooooo fun! LOVING those tags!!!!!!!! Fun and lovely idea! Thanks for playing with us at CCD Linky Party! How exciting - I know you can hardly wait to welcome the newest grandbaby to the family! Keep us posted! Your treats looks extra yummy and very festive. I love the tags, such a great touch! I just had to let you know that Emma and I made the awesome white chocolate covered oreos you shared on your blog a few days ago. We had a blast, made a mess, and ate way too much! Thanks for sharing that tasty treat with us! I hope your 4th of July was fantastic! I can only imagine the anticipation on your Grand Baby's arrival 😀. Love the treats and tag! i am sure everybody enjoyed the sweet treats. 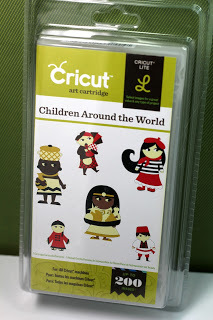 thank you for sharing with us at Fantabulous Cricut Challenge Blog! Thanks for joining our Pretty Cute Stamps Challenge...on our first month ever! 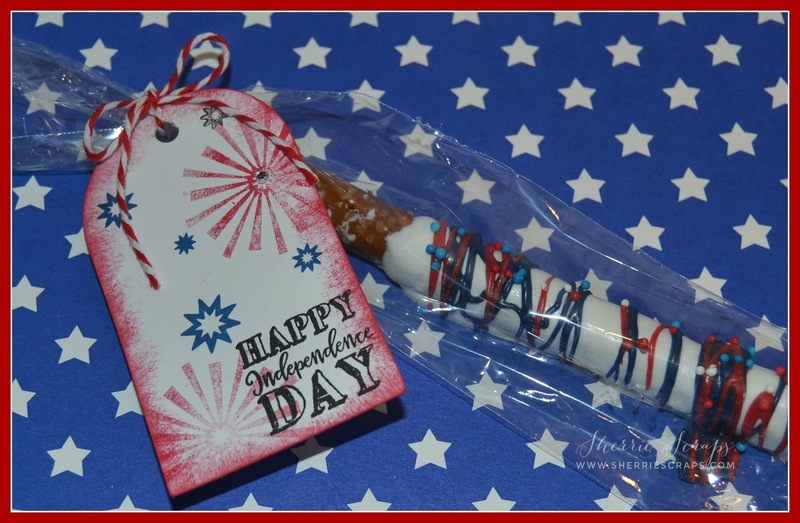 I so love chocolate covered pretzels...and these are so festive for the summer! Beautiful tags. 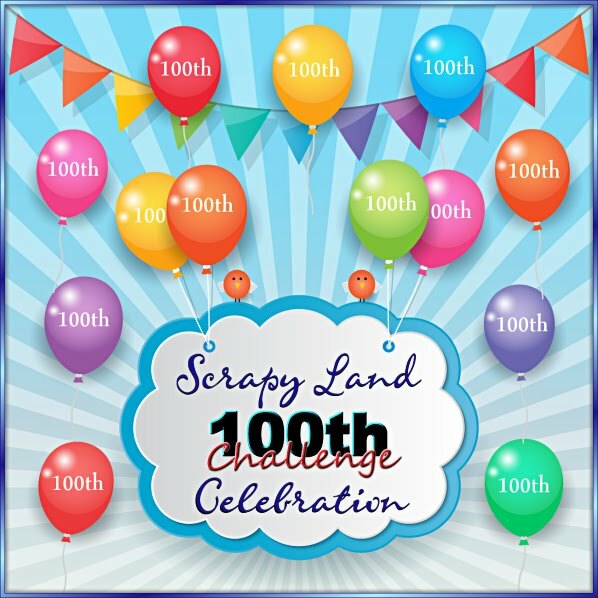 Thanks for playing along with us at Scrappind4Fun Challenges. Hope to see you again soon!! HUGS! Very pretty, love the inking on the edges. Totally YUMMY treats!!!!! Those tags looks AMAZING too!!!! Mmmmm, yummy super cute creations. Did your Grand baby arrived?? Ooooh love the treat tags! What a clever give away treat. What a great idea! 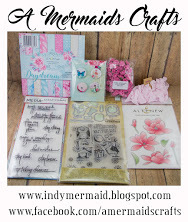 Thanks so much for joining our new monthly challenge at Pretty Cute Stamps! Pretty and festive patriotic treats and bags Sherrie! Thanks for sharing with us at My Sheri Crafts! What a wonderful set of tags! I am sure they won't get thrown away. 😊 Thanks for joining us at My Sheri Crafts. 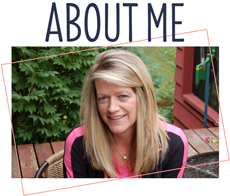 Sherrie ~ Hello sweet friend! I am a tad ~ okay not just a tad behind here! Summer is whipping by and packed with tons of activities! Well aren't these simply ADORABLE, FESTIVE and TOTALLY fun! LOVE how you do these things for your children and friends! I bet your daughters coworkers LOVED them! Totally right about the tags ~ they would toss these beauties away ~ sigh! Wishing you the Happiest of Birthdays!